Anzère lies on a sunny terrace at 1‘500m above the Rhone Valley, only 20 minutes from Sion, the capital of the canton. A popular year-round destination for families, Anzère enjoys some of the most beautiful and dramatic views in the Swiss Alps. Well-maintained and carefully patrolled pistes ensure that skiing in Anzère is always a pleasure and all levels of ability are catered for, with nearly 60km of pistes from 1’500m to nearly 2’500m. Non-skiers will enjoy the many marked walking and snow-shoeing trails and the more adventurous will be thrilled on the long, marked and secured, toboggan run at Les Rousses. Children are well catered for with a games area and a magic carpet for skiing and tobogganing, right on the village square. Anzère will be at the centre of the 2018 games, home to the Welcome Centre, providing the accommodation and restaurants for participants and hosting the Alpine and snowshoeing competitions. A small mountain village, Arbaz is ideally situated 15 minutes from Sion and 5 minutes from Anzère. Sereine, sunny and calm, Arbaz enchants its visitors. Despite its small size, Arbaz offers many activities, both sporting and cultural. A football pitch, tennis courts and a 40m natural climbing wall as well as mountain bike trails and walking paths provide a paradise for all ages. For nature lovers, Arbaz offers forests and fishing lakes as well as a large observatory which, at an altitude of 1’440m, provides a unique opportunity to observe the night sky. An optional guided visit to the observatory will be organised for participants during the games. Arbaz will be hosting the cross-country and biathlon competitions on the beautiful Gô area, easily accessible on foot from Anzère. Please note that the curling competitions will take place in nearby Crans-Montana, only 20 minutes from Anzère. 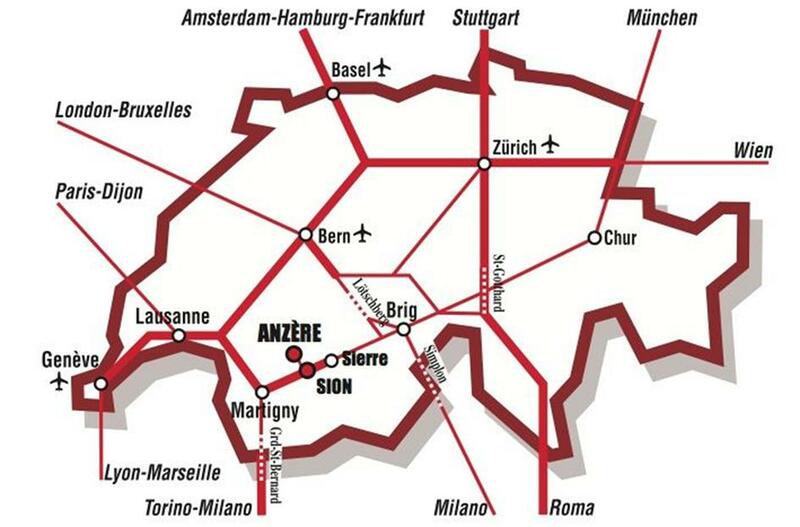 Anzère has excellent road and public transport links. Roads in the winter are cleared of snow quickly and efficiently, although Swiss road regulations require cars to be equipped with either winter tyres or chains during the winter season. Please note that bus transport from and to Sion train station will be provided free of charge to competitors and accompanying persons on official arrival and departure days. The closest international airports are Geneva, Switzerland and Milan Malpensa, Italy, where public transport links (buses and trains) can be found. Sion airport has a very limited international schedule. Exit from the motorway A9 at SION EST (the 2nd Sion exit when travelling from Geneva direction). Follow the exit road and at the first roundabout, turn left, direction AYENT. After 1km, take the 2nd exit of the roundabout, direction AYENT. After the tunnel, there is another roundabout and you should take the 1st exit, direction ANZERE, AYENT. Follow the road, passing through CHAMPLAN after 1.5km. After a further 3km, keep right, direction ANZERE. After only 200m, at the “Coop” shopping centre, turn right at the mini-roundabout, direction CRANS-MONTANA, ANZERE (be careful not to take the alternative route to Anzère, signposted “Anzère par Arbaz”). After 4km, you will arrive at ST. ROMAIN. Follow the road to the left, direction ANZERE. After 5km, you will arrive at ANZERE.